According to a report[i] issued by Reuters quoting an eyewitness, up to 3,000 Han Chinese gathered in People’s Square in Urumchi on September 3, 2009 to demand the resignation of Xinjiang Commu nist Party Secretary, Wang Lequan. The protest was prompted by rumors of a spate of stabbings in Urumchi, in which victims have been allegedly injured by syringes. The assembled protestors were upset that Communist officials had done little to protect citizens against such attacks. According to the eyewitness interviewed by Reuters, protestors shouted slogans such as: “Resign Wang Lequan, the government is useless!” and “Wang Lequan apologize to the Xinjiang people”. Mr. Wang was seen to address the protestors and to reassure them that action was being taken. Mr. Wang stated that 30 arrests had occurred in relation to the alleged stabbings, a figure which contradicts numbers[ii] from the official Chinese media. Protestors were also reported to have thrown objects, such as bottles, at Mr. Wang as he spoke. The unrest in Urumchi comes during the Muslim holy month of Ramadan in which a number of restrictions have been placed on Uyghur worshippers. UAA believes that the restrictions imposed by Chinese authorities have only exacerbated tensions in East Turkestan. The restrictions[iii] include restaurants forced to open during the daylight fasting period, pressure exerted on government workers of Uyghur ethnicity to sign “letters of responsibility” promising to avoid fasting, and a state-led campaign to offer free food to government employees during the hours of the fast. 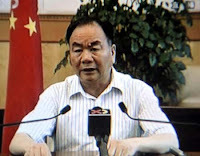 UAA urges Chinese authorities to remove the restrictions placed upon Uyghurs during Ramadan as a first step in addressing Chinese government policy failures towards Uyghurs and in improving the political climate in East Turkestan. UAA also urges the Chinese government to talk with Uyghur democracy leader, Rebiya Kadeer, and with the World Uyghur Congress to seek ways to ease current tensions in East Turkestan and to discuss the realization of human rights and democracy in the region.